Added support and patches for D7000 v1.04. Added support and patches for D3200 v1.01. Added patches for D3100 v1.01. Added patches for D5100 v1.01. Added support for D600 v1.01 (only text patch). Added support for D800 v1.02 (only text patch). Added support for D800E v1.02 (only text patch). Added support for Nikon J1 v1.20 (only text patch). Added support for Nikob V1 v1.21 (only text patch). Congrats on the achievements! So great to see improvement in the Nikon camp aswell! I only have a D600, so I can't test this myself. So I must ask: What does the video time limit removal do? Is it able to span when passing 4gb? Btw, I wrongly typed version history. D600 is supported, just simple text patch for now. As for limit, you can download tool and read tips after loading firmware, it has answers. Wow, great to see D600 on that list :) I downloaded the nTool and loaded the new D600 firmware, and I see the option for testers with the "simple text patch". I think there is still a need for more information, so we kan keep this thread as "on topic" as possible. Would e.g. be great if the main post indicated what the "simple text patch" actually is, and why it is indicated as experimental (what risk is involved in trying it?). I think there is a great deal of Nikon users interested in this, and also who want help testing. But most need a little more information, so we know the risk :) If timelimit removal will work as a stable patch on the D600, that would be so fantastic. Again, great work!! @Vitaliy Are there any plan to add support for Nikon D5200? Would e.g. be great if the main post indicated what the "simple text patch" actually is, and why it is indicated as experimental (what risk is involved in trying it?). Click on it and read tip text. Are there any plan to add support for Nikon D5200? D5200 firmware is not awailable last time I checked. Thank you providing something for the Nikon users :) I have a Nikon D600 so I downloaded the newest firmware and the only thing I see is the text patch. Does the text patch remove the 20 recording limit? There are no options or anything so I am not sure what this patch will do. Nope, it is text patch that changes "Firmware version" text. Just for testing. Normally if you click on patch you see tip window to the right. i have d800, is there coming something more than text patch? But you could test it and let me know. OK, I'll look into this. Added battery patch for D3200 v1.01. Added support for Nikon J1 v1.30 (only text patch). Added support for Nikon J2 v1.10 (only text patch). Added support for Nikon J3 v1.10 (only text patch). Added support for Nikon V1 v1.30 (only text patch). 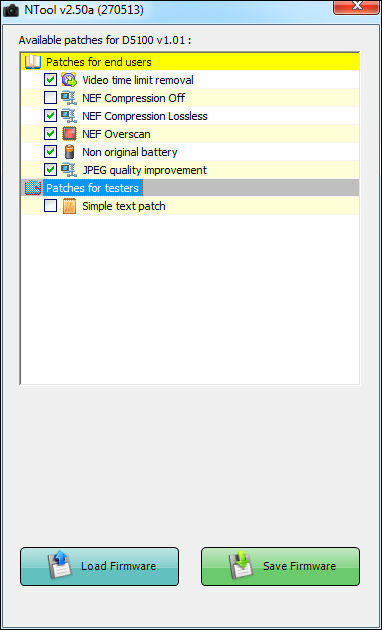 Added support for Nikon V2 v1.10 (only text patch). Added support for Nikon S1 v1.10 (only text patch). Note that Nikon 1 bodies firmware update can not work if you already updated to same firmware. If someone do not understand, it means LiveView Raw. Overall D7100 firmware is quite different to D7000. All menus seems to be image based now. i downloaded the software but it says load firmware should i download the firmware separately for the patches to come please help. im trying to get rid of the battery error on my d3200 when i use a third party battery grip. downloaded the software but it says load firmware should i download the firmware separately for the patches to come please help. Barely understand you. As for firmware, of course you must download it yourself from Nikon site. You better ask @Simeon . I just made NTool, not D5100 full reversing and D5100 patches. Shame the D7100's major let down is its sd card write speed. SD is most common card now. CF really went to niche, sometimes hard to get in distant places. CF card is king as sustained writes at 1000x speeds materialise into >94MB/s writes. In the 5DMKIII it achieves this with good cards, however its sd card controller is a serious let down - just like most sd card cameras of today.